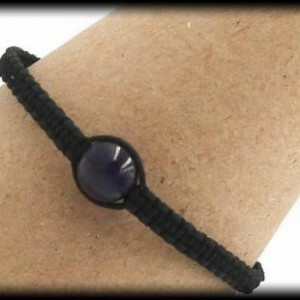 Straighten out your chakra with this natural looking beauty! Teak Wood, known as Holy Wood, emits energies and blessings that aids in generating wealth. It is also said to have healing properties, enhances clarity, learning,concentration, study, and focus. 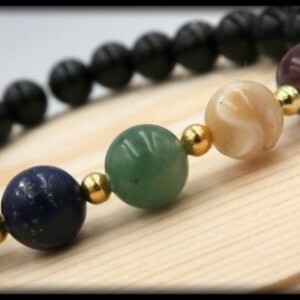 Created with nature in mind, this Teak Wood based bracelet is joined by the energies of Clear Quartz, Amethyst, Lapis Lazuli, Green Jade, Citrine, Carnelian, and Black Onyx for your chakra system. From opening your intuition and enhancing your spiritual awareness, to restoring vitality and motivation. This wooded beauty is handcrafted with 8mm Teak Wood, Clear Quartz, Amethyst, Lapis Lazuli, Green Jade, Citrine, Carnelian, and Black Onyx. SIZING INFORMATION Please measure your wrist with a measuring tape to ensure the most accurate measurement. If you do not have a measuring tape, you can also use a string by wrapping it around your wrist and then cutting the piece of string. After you have your cut string, place it alongside a ruler and write down your measurement. To ensure a perfect fit, please had 0.5 inch to your wrist measurement, if you want a little room please add .75 inches to your wrist measurement..